The medals for the 2015 IPC World Championships were revealed today marking the 50 day decent towards the competition in Glasgow, Scotland. Featuring the logo of the World Championships, the medals are in the shape of a rounded square. On the back, the IPC Swimming logo is present along with a braille translation. 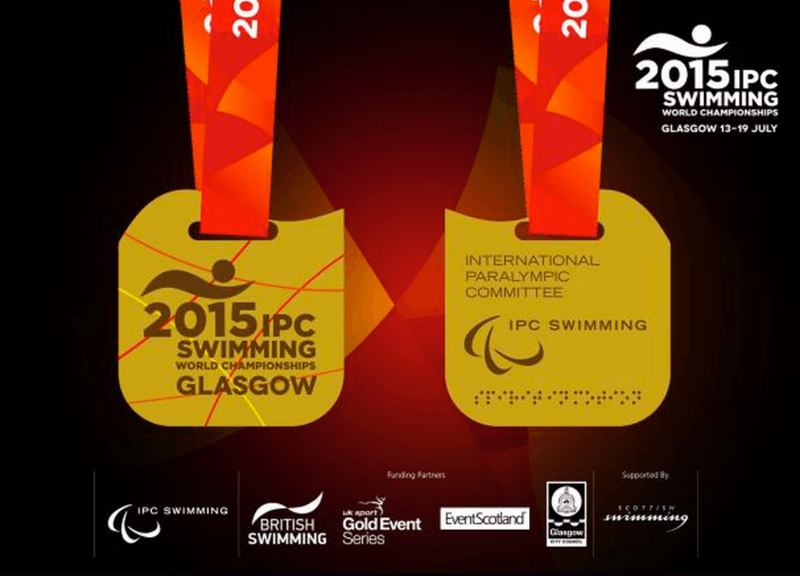 The competition will run from July 13-19 at the Tollcross International Swimming Centre. That facility saw plenty of fast swimming last summer as Glasgow hosted the Commonwealth Games. There, it was evident that British swimming is on the rise to stardom. This summer, 550 of the world’s best athletes from more than 60 countries will be competing as the 2016 Rio Paralympic Games approach. For some countries, this meet will stand as the qualifier for the Paralympic Games. Originally, this meet was supposed to be a European Championship, but the IPC upgraded the event to a World Championship showing the growth of Para-swimming not only in Europe, but globally. The event was also originally scheduled for July 18-25th, however was moved a week earlier. With the change, there’s no overlap between the IPC World Championships and the FINA World Championships which will be held in Kazan, Russia. Tickets for the event have been on sale since December.